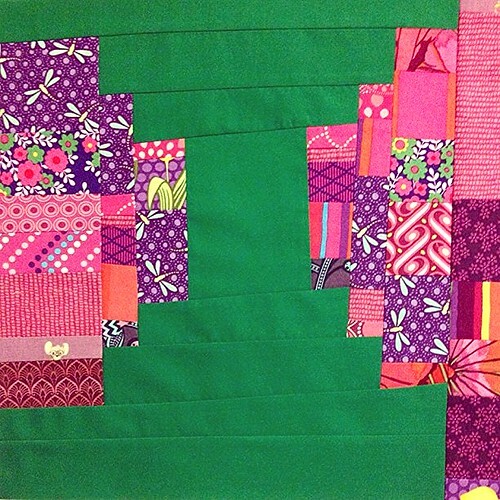 Playing around with scraps and solids, a photo by seahorsequilts on Flickr. Lately I've been experimenting with different ways to use all the scraps of fabric I can't seem to throw away. I spent some time (ok it took much longer than expected) to sort my scraps by color. Of course there's always that one pile left of ??? I just threw that all into its own little Baggie. Then I started randomly sewing together my purples into strips. It's kind of amazing how much useful fabric you can come up with just by piecing together some scraps. I'm not entirely sure where I'm going with this, but I like this block. It's actually the third attempt at making something out of these scraps and this green. I've got lots more scraps and some solids to keep playing with. Hopefully, this will keep me entertained long enough to use up lots of scraps (freeing up space and cleaning the sewing room). Also keeps me from buying fabric. I'm trying to use up stash and scraps and spend less on fabric this year.